I have just been stumped and since we are still working towards that whole debt-free scenario, I couldn't really get into the wants of the Christmas season. Not this year at least. Needless to say, Proctor & Gamble contacted me at the exact right time about their Art of Shaving program. The program has only been available in high end department stores until now and is a perfect gift for any of the men in your life. 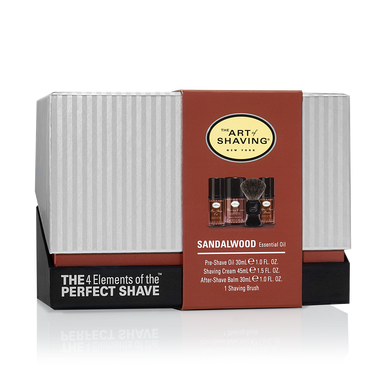 Centered around the Four Elements of the Perfect Shave - Prepare, Lather Up!, Shave, and Moisturize, P&G has even created very affordable gifts for all of the men in our lives to get their shave on without nicks, cuts, ingrown hairs, or whining. What more could a girl ask for? How about the fact that they took the guess work out of making sure that you get everything your men need for the best most comfortable shaves of their lives? That's right, ladies! You can go to the Art of Shaving website, find the scent that you think your man would love (unscented, sandalwood, lemon, ocean kelp, and lavender) and get a kit with everything that they will need complete with shaving cream brushes, razors, oils, and after shaves. But wait, there's more! Proctor and Gamble has given me a few deals to share with my readers! Enjoy 20% off your purchase of The Perfect Shave Solution. Valid unitl 12/30 No code needed. Discount automatically applied at checkout when you purchase a full size Pre Shave, a full size Shaving Cream or soap and bowl, Shaving Brush, Razor and After Shave. Do yourself (and your man) a favor by giving them the gift of the prefect shave this Christmas - your face will thank you for it!